You GIVE love and respect, so from now on you’re going to GET love and respect in return. Live your greatest life…NOW! Let’s face it…you are a good person. You open your heart and give, give, give. All men seem to do sometimes is take, take, take. Well, it’s time for you to change that. If you feel taken advantage of then hypnosis can help. It is most women’s nature to give and to nurture. Often that selflessness is unappreciated, but also it can become a source of misuse and even abuse as you become the door mat for those who selfishly take. 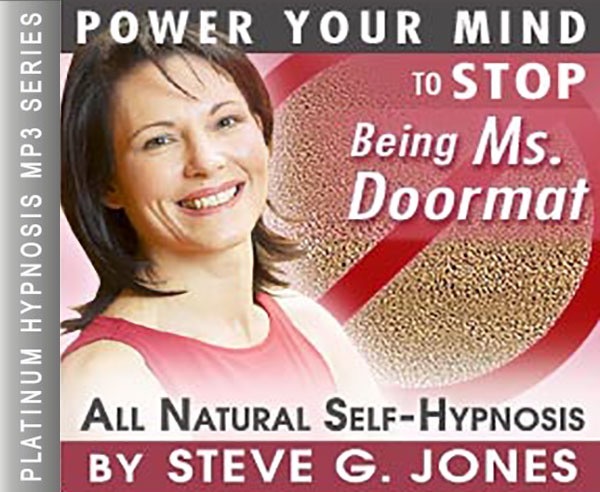 Dr. Steve’s Stop Being Ms. Doormat Hypnosis MP3 can help you change how you respond to those who take advantage of your good nature without changing who you are. Hypnosis is able to help you relax so that a new path for your thoughts can be created and a new way of responding in certain situations becomes second nature. After about three weeks of self-hypnosis, even women who have been giving to a fault can learn to say “no” when necessary and start earning greater respect from those around them. No More Ms. Door Mat is the name of a self-hypnosis program created by Clinical Hypnotherapist Steve G. Jones. Jones is able to walk you through the steps of relaxation that will open your mind to changing your responses. Because hypnosis cannot change your personality, your giving nature that makes you who you are will not change. You will still be loving and responsive to those who respect you and to whom you want to give of yourself. What hypnosis can do is draw upon the latent part of your psyche that is pushed aside when someone makes a door mat out of you. This confidence and assertive thinking is reprogrammed to work when it is needed. Often a lack of self esteem is at the root of the problem when one is made a door mat. Hypnosis can help you realize your self worth and then channel that confidence into positive responses and actions the next time someone tries to prey on your good nature. Women and self-improvement go together. Women are improving all the time. We notice millions of details, hundreds of little things, and probably make a lot of improvements on our own. Women have great strengths but they can also have a few areas where doubts creep in. Women in general have a harder time saying no to anyone. When it is someone we are close to, or worse afraid of, well, what’s the harm in saying yes when a little comprise might make someone else’s life easier? Occasionally that’s fine if we are really consciously choosing to say yes because we want to and not because it will make the other person happy. That’s often the slippery slope. Sometimes that’s part of what becomes a huge pattern, saying a lot of little yeses when we should have said, or really would have liked to have said no. Our minds are complex. Part of our minds wants to do one thing and another part of our minds tells us to do the opposite. That’s where hypnosis and self-hypnosis can really help women get it together. With all we take on as women, it’s easy to stretch ourselves too thin and feel bad afterwards, either guilty that we couldn’t do it all with ease, or didn’t want to do it all, or did it and didn’t get much thanks. Maybe one of the reasons we compromise a little more than we should is because we want so much for the relationship to “work out”. We want our business environment to be calm. (Even if we are not calm inside.) Maybe we just don’t want to have a confrontation. We imagine it will be unpleasant. Hey, most people avoid unpleasantness. If we are really honest. The largest part of the real reason, deep down, we let people walk on us a little bit or walk all over us is we think this will make them like us better. We are afraid that if we didn’t compromise, if we didn’t over-compromise, they wouldn’t like us anymore. They would fire us, they would leave us, they wouldn’t pick us up to begin with, and they would take all their toys and go home. Sometimes we let them cross some boundary line we set in our mind that we said we wouldn’t let anyone cross. Sometimes we let them yell and scream and rant and we just look down and wait until it “blows over”. If it is our boss, so we smile with clenched teeth while really seething inside? Do we just nod and say right away, and “fix it”? If it is a child who is crying and whining and stomping do we give in to every tactic for every piece of candy and wanted thing creating a spoiled child with no discipline? Perhaps you’re one of those people who anticipate the needs of your boss, your boyfriend, and everyone else you can around you to try to please the people around you before they even get upset or ask for too much. With little things or big things we all do this sometimes. In the end we not only hurt ourselves, we are not helping the person we let walk all over us either. Self-help, self-improvement, and self-hypnosis, will help break this pattern and you owe it not only to yourself but also to everyone you come in contact with now and for the rest of your life to learn a different way of being. We acquiesce, that’s a fancy way of saying we yield to someone else’s desire over our own. When we “give in” and let go of what we want that we get into real trouble. There is a saying that defines the difference between healthy giving like a philanthropist and unhealthy giving. The saying goes, ‘An altruist, gives from her extra, a martyr gives from her core.’ When you give away a little part of yourself by not being true to what is right for you, you are being a martyr and you are the only one who knows it. Why do we do this? Human beings are tribal creatures. We all want people to like us. We ask ourselves, how do I get him to want me? We want people to like us more. We want our boss to like us more. We want our current boyfriend or husband to like us more. We want that hot guy down the street to like us more. We want Brad Pitt to like us more. And we were taught, over and over again that if we were just nicer, just more complacent, then the perfect dream would come true. We were told this over and over again. Sometimes before we went to sleep. In a way, this is similar to hypnosis. In fact, if you took this to the extreme, you could call this society hypnosis. While it is fact not hypnosis, the society itself suggests and probably has suggested, since you were young, that if you were just nicer, than more people will like you. Here’s the thing. You need to like yourself more. First and foremost, hypnosis and self-hypnosis are about your relationship with yourself. Hypnosis is about how you think. Hypnosis is not about your daily random thoughts. You know the thoughts that seem to run through your head about a million miles per second. They don’t actually go that fast. But your conscious thoughts do actually go through your brain at abut one hundred and ten thoughts per second. Self-hypnosis is not about those thoughts. It’s about underlying things that really drive you. I would like to suggest that if you do things, big or small, that you really don’t want to do to please someone else, a phenomenon sometimes known as “people-pleasing”, maybe you are doing it because you think it will win you some invisible coin in the ‘He-likes-me-better-now’ bank. Your underlying programming, that you don’t realize is there, is running you. It was probably put there when you were very little. When you were young you couldn’t decide, using tools like hypnosis and self-hypnosis and all the other self-improvement tools available to you now, what your underlying thoughts would be. Whenever we are in doormat mode, the underlying program that is running is basically: The more I do for you that inconveniences me, the more I get in my special ‘I’m-a-really-good-self-sacrificing-girl’ coin. That’s a rational, reasonable thought. But if that were true then, it would then stand to reason that if we just sacrificed enough, all of a sudden the boss, husband, kids, or next boyfriend, or superwoman next door or whoever it is that day that we let convince of something, would suddenly realize how much we did for them. Maybe they would even realize how much it cost us. Would they then like us for who we are as opposed to what we did? Would they one day wake up and say, “Ooooh, you’ve done so much for me, now I love you for who you really are underneath.” Hypnosis, especially self-hypnosis will create great things in your life; it will not suddenly change the laws of the universe. If you’ve been creating a pattern where you haven’t been listening to yourself, when you wanted to say no, then why should anyone else listen to you? This is where you are going to have to make some changes. It would be nice if we could automatically get people to understand what we want from them just because they are getting what they want from us. Unfortunately it doesn’t work that way. Here’s the basic reason why. One, when someone walks on you, they don’t realize they are inconveniencing you. Two, if they did, by some miracle, know they were walking all over you, they would think you were a complete wimp, and rightly so. This is actually a symptom of a much larger problem and the time to start changing how people view you and how you view yourself is right now. But how do I get people to like me? How do I get more people to like me? How do I get someone specific, my boss, my boyfriend, and my neighbors’ kids, to like me, without bending a little? Men, Women, kids, dogs, and cats (no studies have been done on parrots, but it probably holds true for them too) look for three qualities in a person that make them attractive: confidence, authenticity, and passion about what they feel most strongly about. Let’s say that another way, men (and women, children, dogs, cats and maybe parrots) find three things very attractive, supremely attractive: confidence, being who you really are, and gusto for things you love. More importantly than what other people think you will like yourself better if you have confidence, authenticity, and passion. The Stop Being Ms. Doormat Hypnosis MP3 session will help you with this. When you let someone else use you as a doormat, where do your confidence, authenticity and passion go? Who likes you better? Not the men. The children might like you better for a minute if you buy their love with candy, but is the trade off worth it. Are you willing to hypnotize yourself to get out of it? Does Brad Pitt like you more? Maybe the parrot. People let themselves become doormats because there is a crack in their self-esteem. Everyday life, from the time we are old enough to toddle around brings us experiences, and a lot of those experiences are going to knock our self-esteem. The more knocks we get, the more defenses we build up. The more defenses we build up, the harder it can be make changes. Like a well-armed guard at the door of building, our defenses may be so built up that a new thought might have a hard time getting through and taking hold without some help. Sometimes we do certain things and we don’t even really realize we’re doing them until we look back. It’s a lot easier to make mistakes when you are allowing someone else’s wishes to take precedence over what is really right for you and the situation. It’s also a lot easier to be a doormat than it is to make a decision and have to take responsibility for it later. As women there is a very subtle training to stand back and let someone else make some of the decisions. Even with all of women’s lib, many women have been taught, through many generations that on some subjects, like women and money that it is something to think about but not talk about. It is on the subtle programming that hypnosis and self-hypnosis works best to undo old programming and put in new goals and ideas. So we give and give, we think and think, we talk and talk, but we don’t actually say the words that would make us stand up for ourselves. We think the people around us, especially the men, who may not pick up on our subtle underlying word clues, should be mind readers. Then sometimes we wonder about men, and the women who walk over us too, and think “How could he or she be so hardheaded? Why didn’t he know that he should be grateful that I did that for him when it was such an inconvenience for me?” Then we don’t like to admit that we thought that. We hide that thought, and go on doing multiple tasks in our day with a small buried resentment we barely noticed. Sound familiar? Everybody does it to some degree. When you stop and get honest do you do it more than you would like? Are there other ‘mental tapes’, self-talk voices that war with each other or play out negative possibilities or fantasies, what you would do if you just had the power to “get even” or “level the playing field” or “really let him have it”? How much time do you spend on what you wish you had said? The great thing about hypnosis is that hypnosis is a state where you are more open to the suggestions that would really be helpful to your truest goals. The deep goal here is not just to stop people-pleasing or stop being a doormat. The deeper goal is to have such a clear, sure sense of self, to be such an attraction magnet to people of such great quality, that if someone asks you for something (or worse, demands something) that is in the least bit uncomfortable, you intuitively know the right response automatically. One of the great things about the Stop Being Ms. Doormat Hypnosis MP3 audio is that it entertains the well-armed guard, slips through the defenses, enters the building and plants and nurtures new ideas, to improve self-esteem, help give you confidence, and remind you to be strong in who you are at a deep level. When you have a self-hypnosis MP3 you play it again and again so that you get your changes from the inside out. Usually when someone wants something from you, they are only thinking from their point of view, getting what they want. They have no idea how you feel. No one knows what you are thinking and feeling unless you tell them. If you don’t say, right in that moment, and I mean say out loud, what you are thinking and feeling, it is very possible that you are going to get taken advantage of. If you don’t know what to say, you can hypnotize yourself, after buying a few of these mp3s and learning these techniques to say you need twenty-four hours to think about it. People will find this unusual coming from you and you may find it difficult to do the first few times. But really, deep down, no one likes a doormat, not even you. People like people who stand up for themselves and what they believe in. People respect people who say no, even when they don’t like it. Like any new behavior, it’s not easy, which is why self-hypnosis is here to make it easier. One important thing is to practice this now! Practice standing up for yourself as much as possible as often as possible, with grace, so that when it really counts those muscles are strong. This is a skill that is vitally important. You don’t have to say it loudly, but you must say it out loud and with conviction. Look at the person straight in the eyes when you talk to them and maintain eye contact. As you do this you will gain confidence and you will notice that this will also help you lose weight if that is what you desire and achieve other goals that you may want like have clearer skin, have more success in business and make more money, and improve all your relationships. You are so relaxed and focused and just drifting now, just drifting, relaxed and very focused now. Focused on the sound of my voice, focused on the relaxation. And you realize now that in every situation you honor yourself. You honor yourself in every situation. I want you now to imagine yourself speaking with a male, any male you choose and see how confident you are. Notice that during the conversation you continue to honor yourself and you expect to be treated kindly and with respect and you are treated kindly and with respect by him. And if at any time you should realize that you are not being treated kindly or with respect by him, you simply leave the situation, that’s right, you simply leave the situation because you honor yourself. You are an amazing and powerful and beautiful lady, amazing and powerful and beautiful and you deserve to be treated with kindness and respect. You are like a beautiful flower and you deserve sunshine and soil full of nutrients and pure water. You deserve all of these things. You deserve to be nurtured just like a beautiful flower. You expect all of these things and if at any time you realize that a male is not providing these things, you simply leave that situation, that’s right. Leaving that situation provides you with power, power, power. You are very powerful, very, very powerful. So relax now and drift. I would like now to imagine yourself. Imagine looking at yourself in the mirror and really notice how beautiful you are. I want you to look into your soul. Imagine yourself looking into your soul and seeing your true inner beauty. And from now on you will let this inner beauty shine. You will let it radiate from you, that’s right. And anyone who does not respect your inner beauty is not right for you. You only associate with those who respect your inner beauty because you are powerful and you honor yourself. You are powerful and honor yourself. You honor yourself. You honor yourself. You honor yourself. So relax and realize just how powerful you are. For many women, it is hard to say no to other peoples requests. Perhaps you feel the need to please and this makes people take advantage of you. It does not have to be this way. You can take control and prevent people from walking all over you. You are a strong and capable woman, capable of sticking up for yourself. This hypnosis session will put you back in control. You will no longer feel as if other people have control over your decisions. This Stop Being Ms. Doormat Hypnosis MP3 recording allows you to say “no” when you want to say no and “yes” when you want to say yes. Hypnosis is a powerful tool to use to give you more confidence and to help you demand respect from other people. After listening to this recording for 21 nights in a row, you will have the power you have been wanting. The ball will be in your court. You are strong and hypnosis will help you develop your strengths.